In fact, the X-Terminator is not a new circuit of my own, but my third ‘classic’ reconstruction, following the Hedgehog (a variation on the Atari Punk Console) and the Cracklephone (my version of Michel Waisvisz’s Cracklebox). The X-Terminator is really Arthur Harrison and Kevin Buckholdt’s Cacophonator. You can read all about it here: http://theremin.us/Circuit_Library/cacophonator.html. 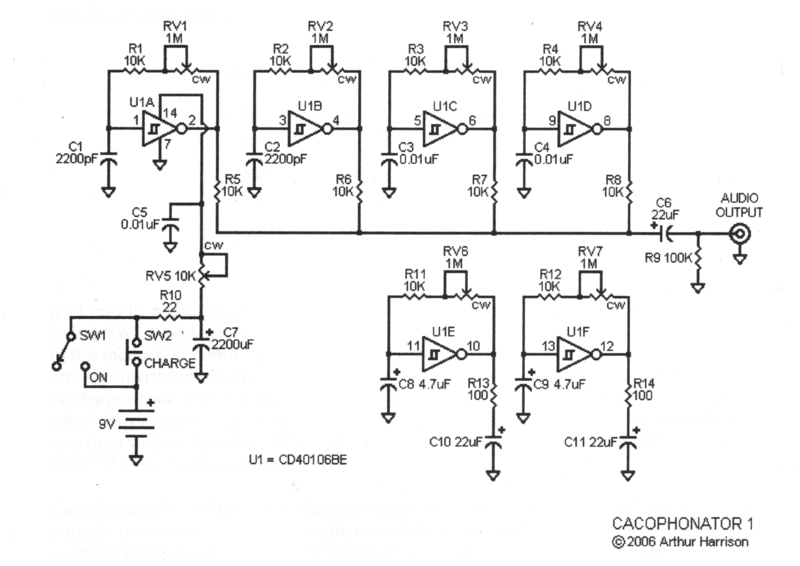 Essentially, it’s a fairly straightforward six oscillator circuit, using all six parts of a 40106 chip. Cleverly, though, it’s designed without the usual precautions to keep the oscillators completely separate, and, indeed, has extra features which in operation cause them to affect one another. Only four of the oscillators actually sound: the other two are just there to interfere with the power supply and cause further mayhem. As can be seen, it also contains an enormous 2200μF capacitor which can be switched into the circuit, operating the oscillators for as long as it takes to discharge, and a ‘starve’ control to increase the power supply impedence. I didn’t make any significant changes to the published circuit in this case, mainly to avoid upsetting the delicate balance created between the oscillators. 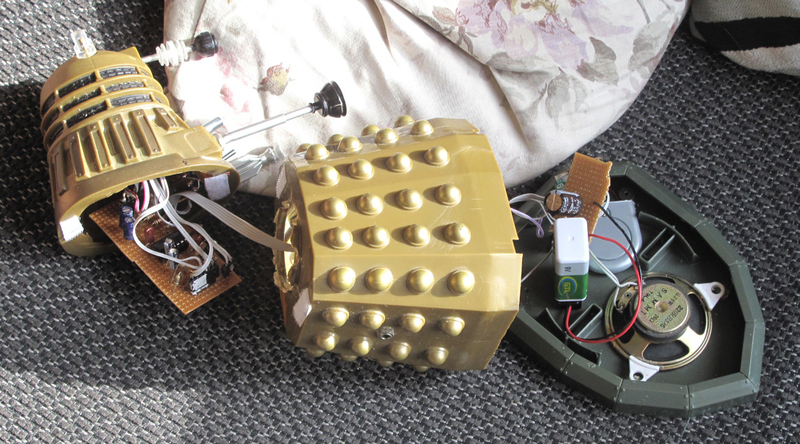 I combined the latching and push switches of the original (bottom left of the circuit diagram) into one, using a single ON-OFF-Momentary switch, and housed the circuit in a plastic Dalek, approximately 20cm tall. 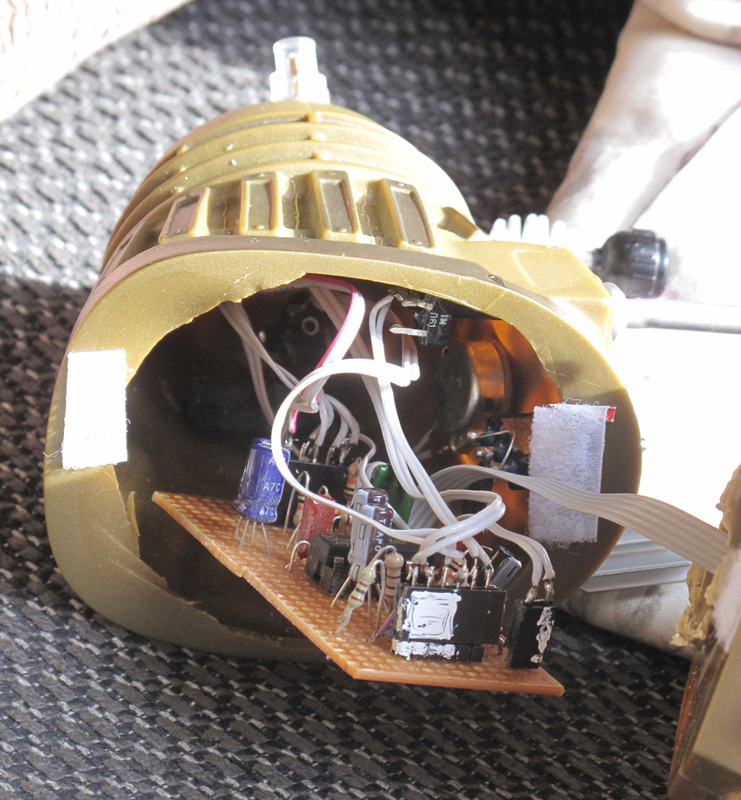 This view of the inside of the base shows the PP3 battery clip glued in place, with battery standing up in it, and the small secondary circuit board containing the large capacitor and small resistor which are placed between the battery and the 40106. 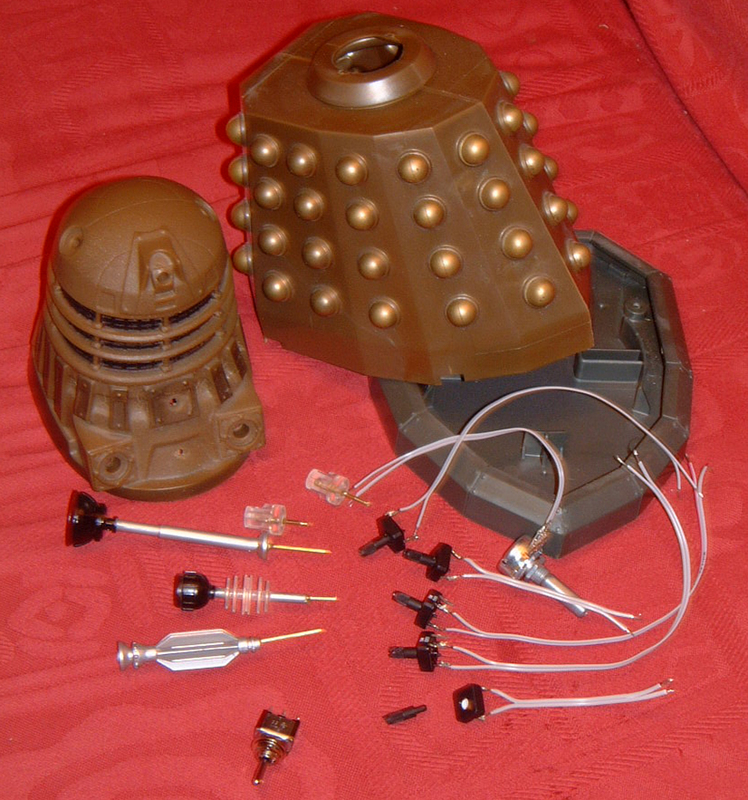 The speaker and other small circuit board in here are not part of the Cacophonator: the small board comes from a Dr Who talking key ring, which I dismantled. 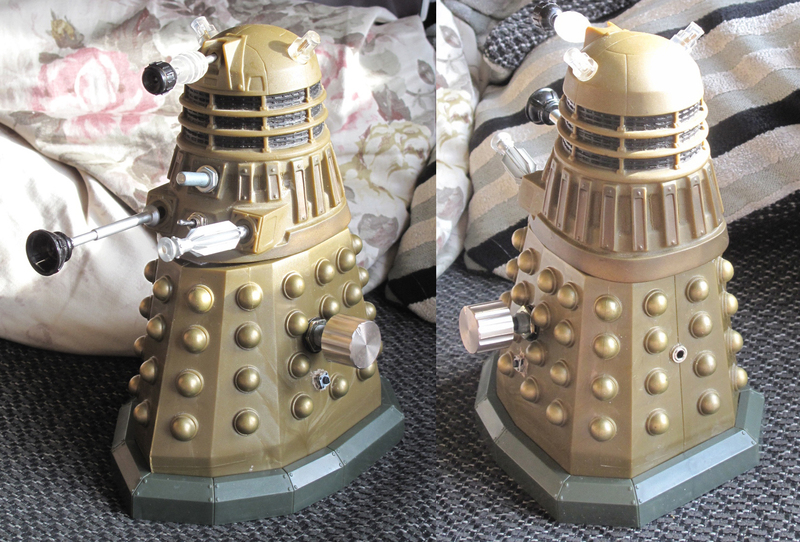 A button on the outside of the case produces the phrase ‘Exterminate!’ through the speaker. 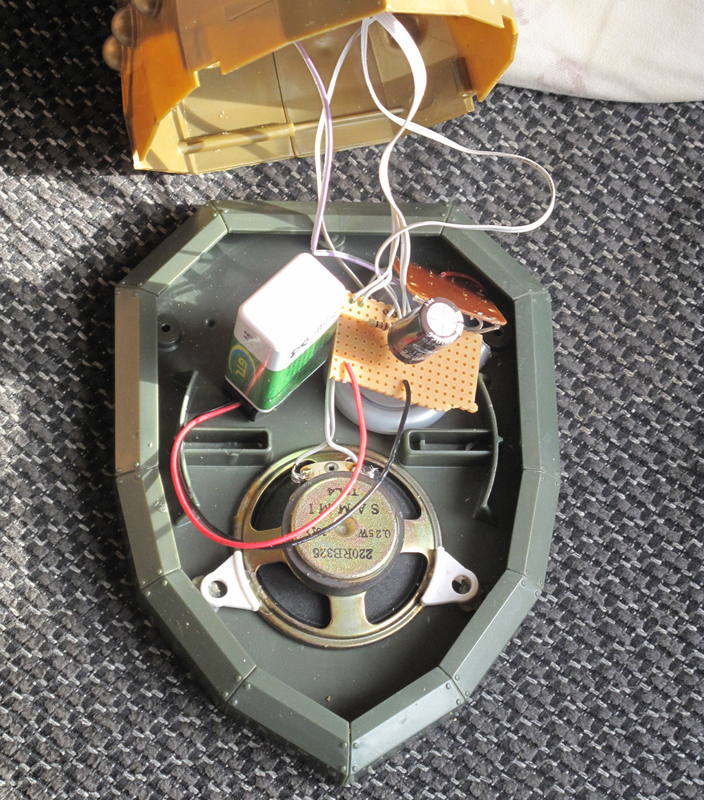 So as not to interfere with the working of the Cacophonator circuit, I kept this entirely separate, and it’s powered by a small 3v CR2032 coin battery. In operation, it seems to perform exactly as described in Arthur Harrison’s article referred to above. It’s worth noting what Harrison says, that the discharge time of the large capacitor is affected by what the output is plugged into: the higher the impedence of the following circuit, the longer the discharge time – and therefore the longer the cacophony continues after the momentary switch is closed before it finally winds down. With the latching switch closed, of course, it continues to sound, but requires a little manipulation of the controls – especially the ‘voltage starve’ control – to remain interesting.